Identity Thief's art is basically the same concept as Unmake, from Shadowmoor - and in a third color entirely! I'm not sure why you would ever let someone out if you trapped them in a mirror, because surely their first act on returning would be to kill you, but for gameplay, it does make some nice combos with the likes of Mulldrifter and Captain of the Watch. Of course, the timing of his trigger means that topdecking a Titan or a Dragon is slightly less intimidating to opponents and carries a new risk - it'll be interesting to see if anyone changes what sort of high-end creatures they play as a result of this card's existence. I've been playing Hearthstone for too long-- I initially forgot 0-attack creatures were still able to be declared as attacking. Also worth noting is since the Thief removes the target from play for a turn, it can "destroy" Auras on the creature in question, forcing enemy attackers to slough off their power-ups and de-Pacifying your own creatures, as well as providing an outlet to re-trigger ETB or leaves-play abilities. The combo possibilities are endless! Identity Thief is certainly a unique card, being able to take your opponent’s best body from them (to keep it from blocking) and making it hit them in the face instead. Unfortunately, it’s a 4 mana 0/3 with no protection, which tends to make it more “cute” than effective most of the time (since there are a lot of 3 damage burn spells in many formats). 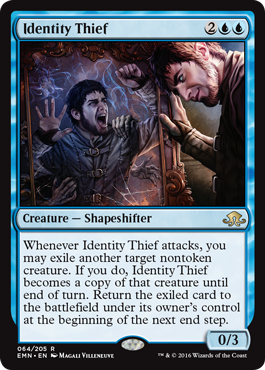 There are definitely matchups where Identity Thief can pull its weight, and it also has the advantage of “blinking” a creature that might have troublesome Auras or a large number of +1/+1 counters on it. Blue has more cards that can do that particular trick and for cheaper, though, and Identity Thief is largely consigned to fringe applications as a result. The art on the set card is suitably eerie, though.